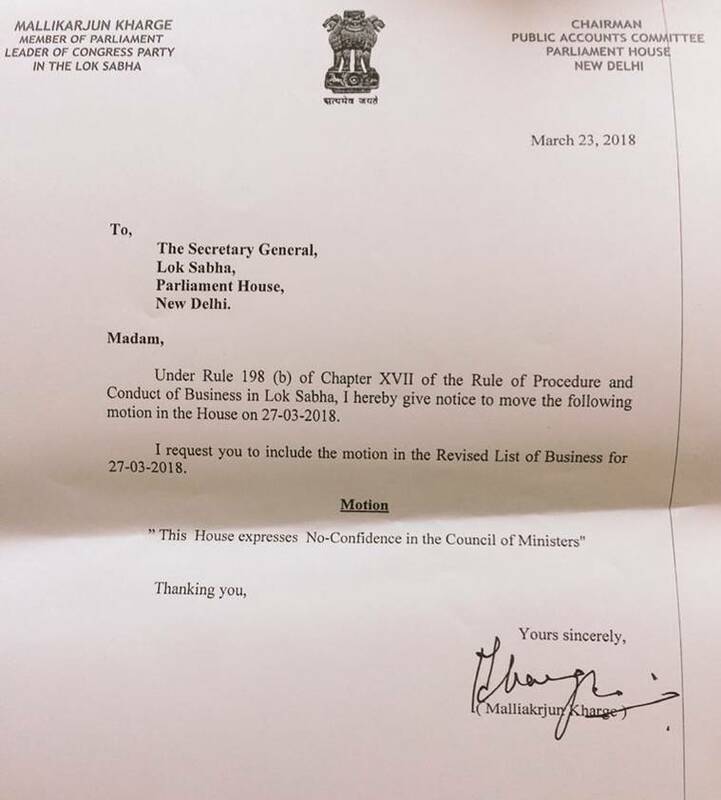 After Telugu Desam Party and YSR Congress, the Congress party on Friday submitted a notice for no-confidence motion against the Modi government in Lok Sabha. In a letter to the Secretary Genral of the lower house, Congress leader Mallikarjun Kharge requested to include the motion in the Revised List of Business on Monday. This comes after both houses were adjourned for the day as the stalemate between the opposition and the government continued for the third week of the second leg of the budget session with ruckus prevailing unabated. Earlier on Thursday, MPs of YSR Congress and TDP, filed fresh notices for the motion. A group of TDP MPs met Speaker Sumitra Mahajan and demanded that she take up their no-confidence motion immediately and start the debate in the House. However, the motion was not talken up again on Friday following continued disruption by Opposition. The YSR Congress-TDP MPs have been pushing for a no-confidence motion to protest against the Centre for nonimplementation of the promised Special Category Status for Andhra Pradesh. An overwhelming number of Opposition parties, including the Congress, have backed the move with a different calculation.